Just a few years ago, The Coca-Cola Company (TCCC) was completely on-premises, looking for a way to move toward their cloud-first strategy. 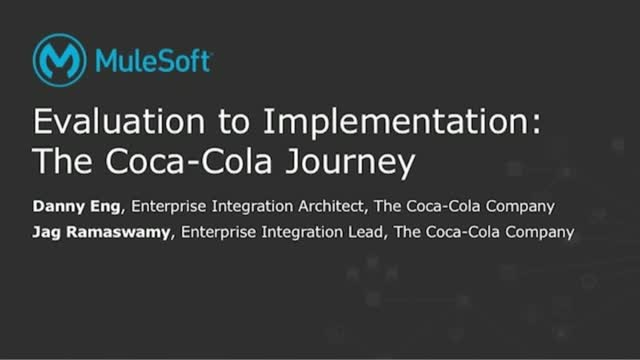 Watch TCCC’s presentation from MuleSoft’s Atlanta Summit to learn Coke’s journey with MuleSoft starting from evaluation to how they are currently taking an API-led approach to integration. With this, Coke is now creating great customer experiences and enabling their sales force to continue to lead through innovation. As the number of mobile users grows to 5 billion in 2019, companies are under immense pressure to deliver engaging and secure mobile apps, and not just for consumers. Increasingly, mobile apps are an essential tool to unlock employee innovation and productivity. With MuleSoft’s Anypoint Platform™ businesses can send data securely from any system to mobile, leveraging agile and continuous integration and continuous deployment (CI/CD) best practices to optimize consumer and employee experiences while driving revenue and operational efficiency. * Connect to systems 64% faster: Easily and securely connect to core systems of record and unlock data with out-of-the-box connectors and graphical data mapping. * Increase employee productivity: Package business processes into reusable services available through internal apps to drive productivity. A billion dollar specialty retailer with over 400 retail stores, New York & Company, is leading the way in building an omnichannel strategy. Recently ranked #3 on the list of best omnichannel retailers, New York & Company is driving digital transformation in retail. Hear from Alex Pinskiy, Director of Omnichannel Systems at New York & Company, as he reveals their journey and success in building an omnichannel brand and connected store. Learn how New York & Company developed a mobile application with real-time inventory availability and was the first in specialty retail to complete end-to-end transactions using in-store kiosks. Customer experience is a top priority for all businesses. Managing customer relationships in a consistent and effective manner is a challenge against the backdrop of fragmented and complex system architectures. This is particularly apparent when it comes to customer data that is held and mastered in multiple CRMs and across multiple lines of business. Hear from Deloitte, the largest professional services firm in the world, who launched a global Salesforce analytics capability in six months and are using MuleSoft to enable a flexible and efficient API-led transformation approach across a complex global program. This seamless set of business APIs is allowing Deloitte to consolidate and surface data from 35+ CRM systems as a transition state to replacing legacy infrastructure. The outcome will provide a single view of customers wherever they are served and transform global customer relationships. - How organizations can consolidate and surface data from multiple CRM systems to create a unified view of customers. - How an API-led approach to integration can help firms transform into digital platforms. - Deloitte’s journey with MuleSoft’s Anypoint Platform and Salesforce, and how they used APIs to transform global customer relationships. The public sector is struggling with the adoption of digital transformation initiatives, according to MuleSoft’s Consumer connectivity insights report. This webinar will showcase the essentials of successful digitalization initiatives in the public sector and how Arbetsförmedlingen, the Swedish Public Employment Service, was able to modernize their complex traditional systems and drive value with digital ecosystems and reuse through API-led connectivity. Watch this webinar, co-hosted by MuleSoft, Arbetsförmedlingen, and Redpill Linpro, to learn how Arbetsförmedlingen overcame challenges with their digital transformation initiatives and why culture is a key factor in building a digital ecosystem. * How to build an open culture that enables open services. * Why digital ecosystems and reusability are the foundation of public sector digital transformation initiatives. * What the public thinks about digital experiences in the public sector. On average, a business supporting digital transactions now crosses 35 backend systems — and legacy tools haven’t been able to keep up. This session will cover how MuleSoft’s new monitoring and diagnostic solutions provide end-to-end actionable visibility to APIs and integrations to help customers identify and resolve issues quickly. This session covers how Anypoint Runtime Fabric provides greater flexibility and simplifies operations––enabling enterprises to transform their businesses faster using public, private, or hybrid clouds. ABB leads one of the most complex industries on the planet; one that is under intense transformation during the fourth industrial revolution. They are succeeding by using digital technology to fast track their supply chain and manufacturing process. Watch this webinar to learn how ABB is accelerating digital transformation through an API strategy with MuleSoft. - How ABB leverages reusability and automation to streamline their complex manufacturing processes. - Why MuleSoft's Center for Enablement is a perfect fit for ABB. - How ABB drives digital innovation through the adoption of API-led connectivity. Government agencies face increasingly complex IT and HR systems. This makes it difficult to reconcile data, manage the hire to retire process, and use data to guide more effective decisions. Join us for a demo-driven webinar as we walk through common challenges government officials face when working with legacy HR systems, and how MuleSoft can help government entities unlock data—making it accessible for reporting, analytics, auditing, and more. - Common challenges government agencies face when working with their current HR systems. - Top HR use cases that MuleSoft supports. - How API-led connectivity can help agencies unlock data, improve time-to-market, and increase reuse of assets––saving time and money. Connecting customer data with users who need it can be a daunting challenge involving disparate systems, multiple data formats, and frequently changing data sources. MuleSoft's Anypoint Platform™ enables multiple teams to unify around a single, fully integrated 360-degree view to understand and anticipate customer needs. Across industries from healthcare to banking to retail, MuleSoft is powering single view of customer transformation that result in faster time to market, improved customer satisfaction, and increased revenue. Business processes are complicated and often manual due to an underlying technology landscape that is not connected, constantly changing, and increasingly complex. With MuleSoft’s Anypoint Platform™, unlock data from your systems, orchestrate business processes that automate and optimize workflows, and package them as reusable services to transform your organization into a digital platform. Across industries from healthcare to banking to retail, MuleSoft is powering business automation, and helping companies deliver business processes as reusable services, resulting in faster innovation, improved customer satisfaction, and increased revenue. Well-designed APIs, created along with a holistic integration strategy with Anypoint Platform, create a seamless omnichannel experience that customers want and businesses need. To deliver a reliable and unified experience more quickly, companies must adopt a new approach that involves an omnichannel architecture. Across industries from healthcare to banking to retail, MuleSoft is powering omnichannel strategies that result in faster time to market, improved customer satisfaction, and increased revenue. Hear from Frank Liberio, former CIO of McDonald's, as he reveals the success behind the global super chain’s digital transformation initiatives. Learn how his team utilized MuleSoft’s Anypoint Platform to open up new digital channels at the speed required by the increasingly competitive marketplace. From mobile applications and kiosks to partnerships with on-demand delivery apps, McDonald’s created a truly omnichannel experience for their customers. Hertz is driving a customer experience transformation with the goal of providing a frictionless customer and partner journey. MuleSoft has been foundational in driving the re-platforming of all of Hertz's customer-facing applications, as they replace nearly 100% of their legacy systems. One emerging API best practice involves treating APIs like products. Similar to products, APIs should be designed with a specific purpose and teams should also deliver APIs using a Software Development Lifecycle (SDLC) framework. Join us for this webinar to get a walkthrough of Anypoint Platform's capabilities, and learn how the platform addresses the full API lifecycle––from design and implementation to security and governance of APIs. - Why Big Bus chose an API-led approach for their omnichannel architecture. - How Big Bus built the a Trade API to support a variety of partner workflows––including onboarding new partners, having a real-time view of partner sales and more. - How Big Bus is benefiting from reusable APIs, which partners can use to leverage features such as viewing availability, booking, and more. MuleSoft makes it easy to connect the world's applications, data and devices. With our market-leading Anypoint Platform™, companies are building application networks to fundamentally change the pace of innovation. MuleSoft’s API-led approach to connectivity gives companies new ways to reach their customers, employees and partners. Organizations in more than 60 countries, from emerging companies to Global 500 corporations, use MuleSoft to transform their businesses.